It’s 6am and I'm woken from a deep sleep by a series of distant explosions that shatter the early dawn silence. I think of my seven horses and wonder if they are distressed, yet as I become cognizant, I realized they’re used to it. This is because we live five miles away from an army camp, where every so often as part of their training, simulated virtual wars are staged through high powered speakers. I get out of bed and walk the path which leads to the horses. Anticipating my arrival, they stretch their necks over the fence making sure I see them. Urging me to hurry up, some of them slam the metal fence with their hooves while others gently nicker, "Come on, we're hungry!" They're completely undaunted by the blasts, which are now coming to an end. Ruby, Jackie and Diva waiting to be fed. I pile the hay into a wheelbarrow and distribute the flakes in specific places, making sure they all get their fair share. Next, I gather their manure, piling as much as I can onto a rake and shove it into another wheelbarrow. As I muck out, I contemplate on my journey here, to this special place. We live on a beautiful retreat, with no visual evidence of any other human habitats. The vast open prairie, holding the shadows of the surrounding mountains, looks and feels like nothing I grew up with. My ancestors originate from London and after my parents were married they decided to move to the country for a better life. Along with my two other siblings, I was raised in a small village, called Herne in Kent. 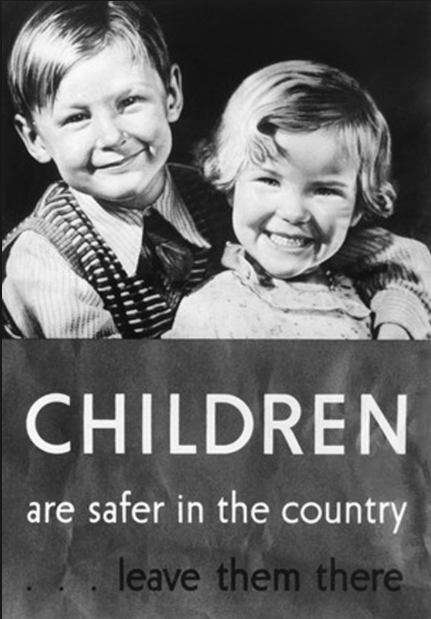 During the second world war, when London was perpetually bombed by German planes, all the children were sent to the countryside where they were taken in by families. My mother told me stories about her experiences at the farm where she was evacuated. She smiled when she spoke about a large draft horse she made friends with and who she rode bare back. She learned how to milk cows and every morning would collect eggs. Despite being separated from her parents and friends in a time of danger and uncertainty, her personal experience of the war, at this farm, was pleasant and left her with fond memories. Children from London evacuated to a farm. As I reflect, I recognize the irony in my journey of establishing a horse retreat, offering refuge and safety to people, who in their life are experiencing some kind of crisis. I've found a safe place where guests can come and deepen their relationship to horses and nature; healing what needs to be healed. The bleed through of the occasional bombings and war scenarios from the camp next door, are like distant echo's from the past reminding me of the power and purpose passed down to me from my ancestors.